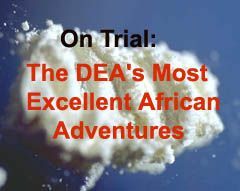 I've been writing about the DEA's most excellent African Adventures since 2009, particularly the sting cases where people from all over the world are extradited (or kidnapped and forcibly brought) to the U.S. for trial on drug offenses that had nothing or little to do with the U.S. In many, the DEA claimed a terror connection. Ginger Thompson of Pro Publica (formerly an outstanding New York Times reporter) has been investigating these cases for a long time. She recently traveled to Mali and other far-off places to interview people directly involved. (Days before she left, I spoke to her on the phone about the cases for a very long time.) Two weeks ago she published her findings in an excellent article called The Narco Terror Trap. The DEA warns that drugs are funding terror. An examination of cases raises questions about whether the agency is stopping threats or staging them. Say hello to the new incancation of the narco-terror war, which I've been predicting for many years, ever since the aborted attempt to introduce the Victory Act. The United States attorney in Manhattan is merging the two units in his office that prosecute terrorism and international narcotics cases, saying that he wants to focus more on extremist Islamic groups whose members he believes are increasingly turning to the drug trade to finance their activities. The new unit, he said, would be better able to bring drug charges to bear against some terrorists, as well as use a new law that gives federal drug agents the authority to pursue narcotics and terrorism crimes committed anywhere in the world if they can establish a link between a drug offense and a terrorist act or group. The Obama administration will unveil a new Afghanistan strategy Friday that calls for devoting significant new resources to counter-narcotics efforts in Afghanistan and economic development in Pakistan. Bump and Update: The WSJ confirms: The U.S. will fight the war on drugs in Afghanistan and enlist Iran in our effort. Coincidence? Vice-President Joe Biden, architect of innumerable oppressive U.S. crime bills, visits Afghanistan and the Nato Commander announces drug raids in Afghanistan are imminent.